On May 19, the Trump Administration formally gave notice to U.S. Congress that they will be renegotiating NAFTA. What comes next? 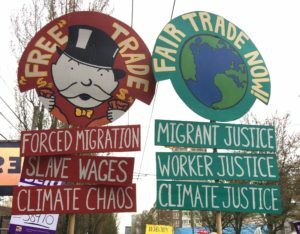 Advocates of fair trade have argued that the deal could be made even worse if the same closed-door, corporate-dominated process is used that has been used for every trade deal from NAFTA to TPP. They have launched a petition to USTR Lighthizer outlining to the top trade negotiator their priorities for a renegotiated NAFTA and calling for a more inclusive process. So far, the administration has not outlined any of its priorities to the public, although a draft plan leaked in March was heavily criticized as a “wish-list” for CEOs and as “TPP 2.0,” with no real changes to protect workers or the environment. May: Countries are now consulting domestic actors as they prepare negotiating positions. Formal consultations are well underway in Mexico, and have just begun in the U.S.
June: Canada begins its formal consultations. The federal government will announce soon that it’s welcoming submissions from Canadians as it prepares its demands. Informal consultations with industry and labour groups have been happening for months. Freeland must also deliver a memorandum to cabinet, and receive a mandate to lead Canada’s negotiating team. June 27: The United States holds a public hearing in Washington, where American stakeholders will share their ideas for the talks. The U.S. has a detailed consultation process that involves committees of the Senate, House of Representatives, and businesses. July 17: The U.S. must publish, around this date, a detailed summary of its objectives for these negotiations. Under U.S. law, the document must appear on a publicly available website and be regularly updated thereafter. Aug. 16: Negotiations can begin anytime after this date, which marks the end of the 90-day consultation period required by U.S. domestic law. At that point, American negotiators are finally allowed to sit with their foreign peers. Fall: Mexican presidential primaries begin. It’s decision time for the man leading Mexico’s NAFTA negotiations. Foreign Minister Luis Videgaray will have to decide whether he intends to turn his focus to seeking the presidential nomination for his party, the ruling PRI. Winter: The Mexican and U.S. governments have said they want negotiations wrapped up by the first quarter of 2018. Otherwise they risk affecting — and being affected by — Mexico’s presidential election. The current front-runner in the polls, Andres Manuel Lopez Obrador, is a left-wing, Trump-bashing NAFTA critic. Numerous observers have called this an impossible deadline. June 30, 2018: The current U.S. fast-track law expires. It could be extended three years — as long as the president requests it, and there is no resolution disavowing it from either the U.S. House or Senate. This law is considered a must for concluding any trade deal with the United States. Under this legislation, American lawmakers forgo their constitutional right to amend a treaty, and agree to pass or reject it with a simple majority vote. July 1, 2018: Mexico holds its presidential election. After that, there’s a five-month lame-duck period as the incoming government waits to take office. Nov. 6, 2018: U.S. holds its midterm elections. All the House of Representative seats, one-third of Senate seats, and state-level positions are up for grabs. Governing activity in Washington usually slows down beforehand. Dec. 1, 2018: Inauguration Day for Mexico’s new president. If a deal hasn’t been reached under the previous government, NAFTA talks could pick up again under the new government as of late 2018 or early 2019. October 21, 2019: Canada’s next federal election. Ratification: Once a deal is reached, it must pass a vote in all three parliaments.